Posted by Ken Wilson in Events. When Comic-Con comes to town San Diego DJ goes into overdrive. 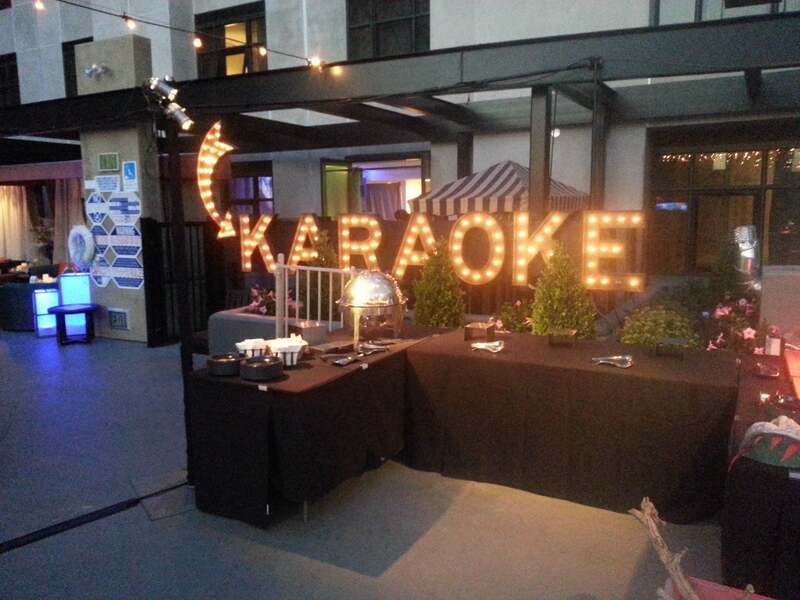 We provide DJ, karaoke, projector rentals and videography for many events that week. It is also Shark Week (around here it is Shark Month) which presented a unique opportunity for San Diego DJ to serve Syfy Channel. They were getting ready to release Sharknado 2: The Second One and planned a preview party at the beautiful Hotel Solamar in the heart of the San Diego Gaslamp District. They asked for a hosted karaoke show, which we enthusiastically provided. The hotel has a large deck area so there was lots to do, and we occupied one of the side rooms. Many people took the opportunity to stop by and sing their favorite song for a crowd of appreciative revelers. It was a wonderful party and organized to perfection by Scott Tallman of Tallman Events. 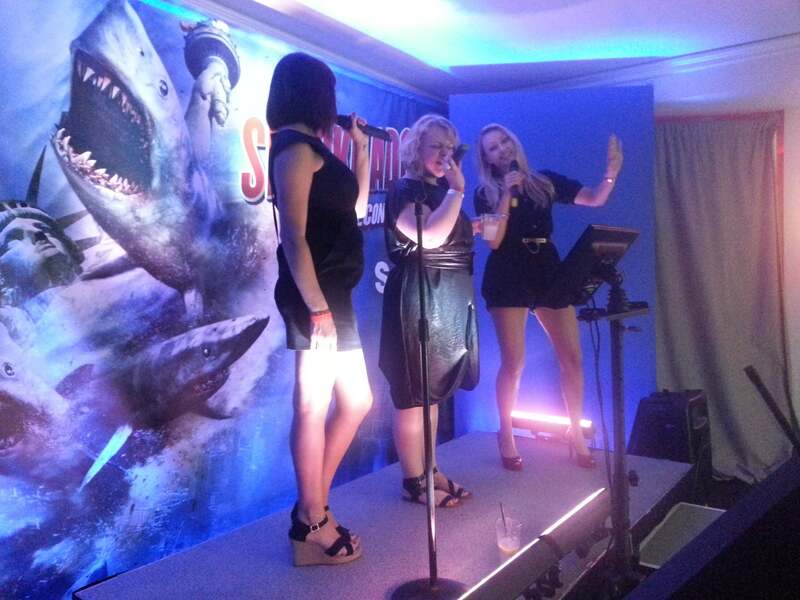 Syfy provided a karaoke stage with a Sharknado backdrop so speakers were placed on the floor to prevent blocking the line of sight to the branding. The room was small enough that speaker placement was not an issue at all, and our premium JBL speakers made everyone sound like a superstar. 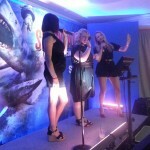 We provided each singer with a wireless UHF Vocopro microphone to ensure rich, static free vocals. We also provided a 19″ HD flat panel LED TV to read the words on. The karaoke was a big hit. Even the director, Anthony C. Ferrante stopped by to sing a song! It was a fun night with fun people and another Comic-Con success story. The hotel staff was exemplary, the planner executed flawlessly and Syfy is a fantastic client. 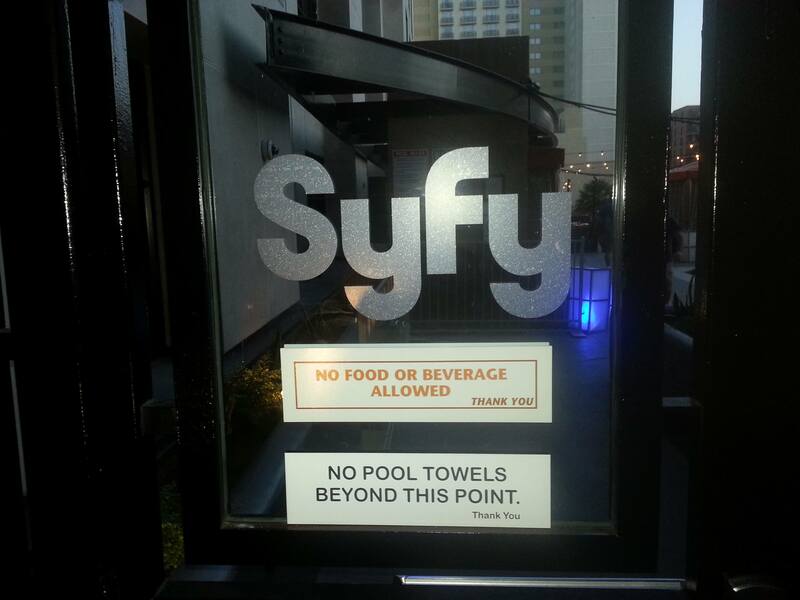 San Diego DJ would love to give you the same attention to detail and all the fun that we provided to Syfy. Just pick up the phone and call 858-356-6622 or toll free at 877-HEY MR DJ (877-439-6735) or use the date checker on our home page. I look forward to hearing from you!